This is the youngest car in the collection. 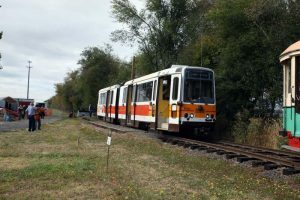 It is a modern Light Rail Vehicle or LRV. 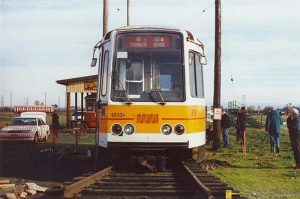 It was originally numbered 1221 and was used as a demonstration unit in San Francisco prior to the arrival of other LRV’s in 1978. The car was returned to Boeing at the end of the Demo and returned as car # 1213. This is one of only 2 cars originally equipped with trolley poles. It was later fitted with a pantograph. 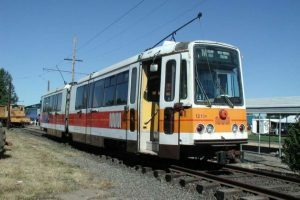 These LRV’s were purchased to replace the PCC’s in operation as well as to run in the new MUNI Metro subway under Market Street. Alas there were many problems with the Boeings and they were replaced by newer LRV’s from Breda. There are very few of these car preserved. This class of car is similar to the LRV’s being replaced in Boston. The exceptions are SF car have steps that raise up for high and low platforms and the Boston cars have air conditioning.